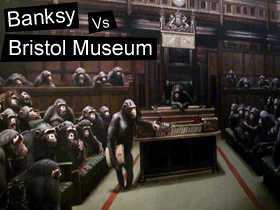 Tig and I were lucky enough to wander down to Bristol museum in the last few days of the Banksy Vs Bristol Museum exhibition. It was a visual feast of thought provoking artistic comment, exactly the sort of revelency in art I enjoy. I took my camera along with me but, (and trust me when I say this), a camera is never going to do justice to Banksy’s works. If I could write even half as well as Banksy paints….I would feel truly gifted. As it is these two short videos show some of my favourite bits of the exhibition, but by no means all of them. Art, like beauty, is in the eye of the beholder. If you think it’s art then it is, and don’t let an elitist art-fart like Brian Sewell tell you any different.